Are you willing to exercise a little discipline? As an architect, there are many things I often suggest – some of them will NOT likely work for you. However, after building our own home in 2007, we learned firsthand several ways to build affordable. If budget is critical, stick to your guns, make the right choices; ones you won’t regret later. These are a few suggestions that worked for us. It is possible to work on a real budget, be green and still have a nice design. Many of these options favor the custom design process, but they can be adapted to stock plans. It also speaks of high owner involvement, an interested and committed contractor and I always recommend hiring an architect to coordinate these items. Keep it small – As we look at the houses around us, we see one common problem – building too big. Just how much space do you really need? Seriously. Instead of building a bigger house, get rid of your stuff – you know, that broken appliance in the basement, those old outdated clothes, and do you really need 3 coffee pots? This one is simple; most families do not need more than a 2,400 square foot house unless you’re the Brady Bunch. This is “green” 101. Avoid useless complexity – One common feature today (in a builder house/plan book house) is a roofline with umpteen gables along the facade with a myriad of things glued on. Rarely can anyone experience that complexity of space inside. Is it just a gift to your neighbors to stare at from across the street? Learn to love the box. The box is the simplest and most affordable thing to build. 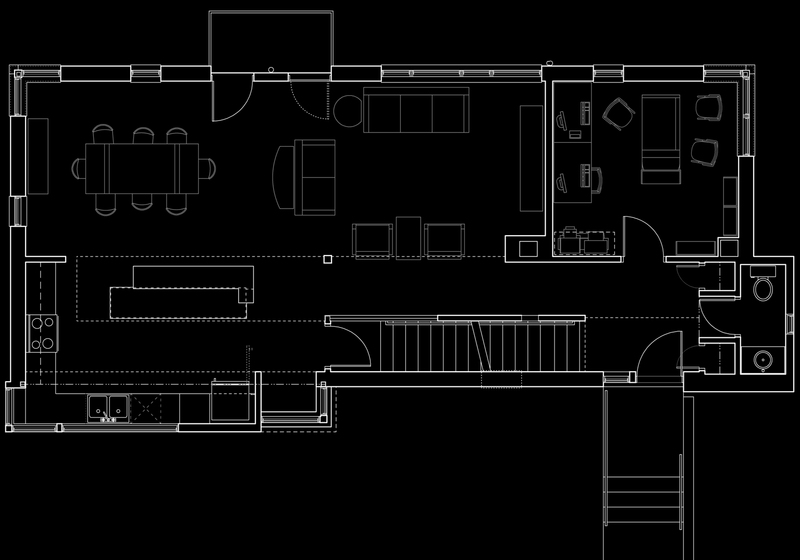 A floor plan that zigzags with multiple corners is something else to avoid. Watch how the spaces are arranged in three dimensions. Is there a logical structural organization? In other words, do walls line up between floors? In many stock house designs, I have seen no logic between floors, which requires additional structural elements to be added to hold everything up, especially the roof. Good design has a clarity to its parts which should make it easy (and affordable) to build and understand. If you want a feature that has complexity, then it should benefit those who live in the house – it should be able to be experienced so the added expense is justified. Open Floor Plan – Keeping the plan simple and open accomplished several things for us. Obviously, fewer walls equal less material; but more importantly, the visual connection between spaces increases the perceived space, making it feel larger. This means my family can be in different parts of the first floor (kitchen, living, dining), but still remain connected. When space feels bigger, you can actually build smaller (see #1 above). This is a win-win situation. Insist on a good plan design to eliminate wasted space – open on its own can fall short of goals. Simple details – This is somewhat related to style but it is critical to price. Fussy details can quickly raise the price. One way we addressed this is no wood casing around the windows (and never crown molding). The jambs are wrapped in drywall with a painted wood sill – quite stylish and clean. Now we use a different detail that we believe surpasses drywall wraps. At the exterior, the brick details are limited to soldier coursing at the window heads and along the parapet. At the window sills, we used stone (a trade from a stone fabricator friend). The brick course directly below the stone is recessed 1/2” giving a bit of detail expressive of the construction process. Simple details do not equate to lesser quality or impact but can keep it affordable. Just like complexity, does the detail contribute to the experience of the owners? Smart material choices – This is where some people lose their minds in an effort to keep up with the Joneses. In our case, we felt strongly about wood flooring, but we couldn’t afford for the door trim and baseboards to be stained/finished wood. The flooring came from a warehouse wholesaler (**gasp**) for a very good price. The doors are solid, but paint grade. You may have to opt for drywall over hard coat plaster, or…laminate countertops instead of granite right now (**blasphemy**). Yes, when the budget is that important, we must rein in our dollars. Make real and hard cuts – you’ll appreciate it when you write your mortgage check. Also, think bold colors and durable materials. Color can bring the unexpected pop to the design; durable materials save money on future maintenance. Splurge strategically – Frugality doesn’t equal sacrifice. If you want to have a few really nice things, decide where it really matters. The remainder of the house can be more modest. The public spaces such as the kitchen, dining and living room can have a higher degree of finish while keeping the bedrooms and bathrooms subdued. You don’t need travertine in your bathroom if you’re building on a budget. I’m sure you can get by with ceramic tile or go green with natural linoleum. 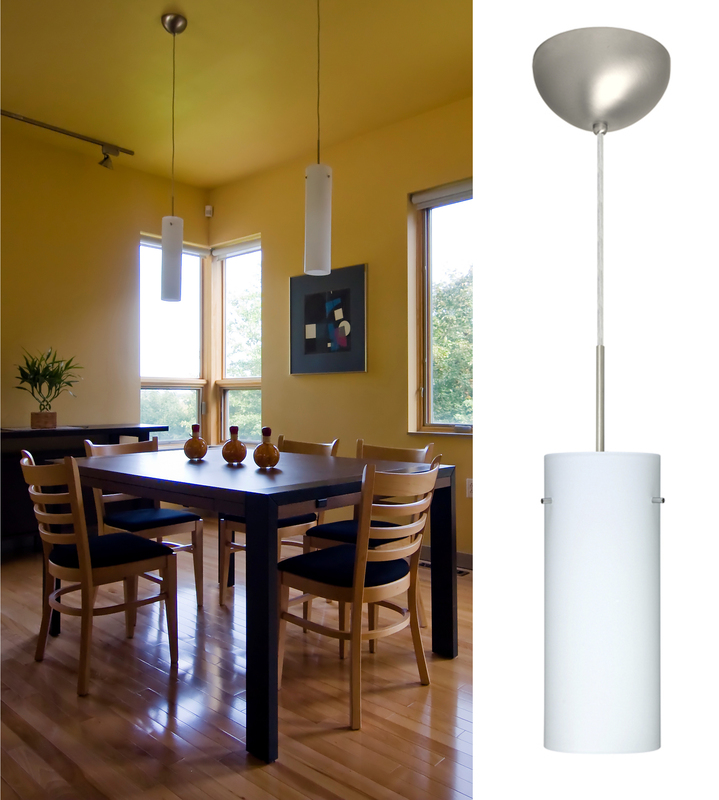 Another way to address this is to choose nice lighting fixtures for rooms such as the dining room and entry. Use plainer, budget fixtures elsewhere – we prefer recessed can lights for a clean and inexpensive solution. Simple clean door hardware in a brushed chrome finish was all we needed. But the custom kitchen bar top that I designed makes a big impact in our house. Avoid peer pressure – Your friends may expect you to purchase materials where they did (or where their contractor insisted they purchase it). What does it really matter where you bought something as long as it is in good taste and fits with your theme? Unless your friends are contributing to your mortgage payment, don’t fall to peer-pressure just so you can say you bought it at such-and-such place. Who cares? We hired a kitchen fabricator that does superb work, yet no one has ever heard of him. He doesn’t need to advertise because word-of-mouth keeps him more than busy. And as for quality, he can’t be beaten. We were able to customize many things that didn’t cost more yet gave a richer result. People are always shocked by how little we paid for our kitchen and bath cabinets. Ask your architect or ask around, I’ll bet you’ll find that obscure carpenter who does excellent work for less than the mainline kitchen showrooms. 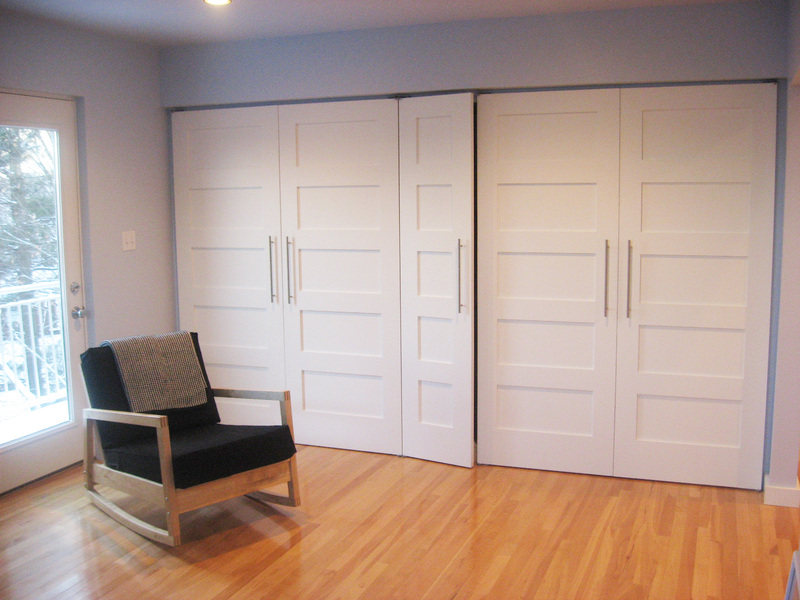 Put the garage in the basement – this one is obvious but causes the most controversy. Who needs a basement that big? Get rid of your stuff, (see item #1). Putting the garage in the basement is virtually free (if you live where there is a slope to the land). In most parts of the country, people will likely build a basement anyway, so add a door and drive in. If you have a completely flat lot, this may cause trouble. Adding another structure for a garage could easily add $70K to $100K (or more) to your project. Think about it, you’re building a little house next to your house for your cars. Unless you have health reasons to avoid stairs, the exercise up the stairs is good for all of us. Oh, and more than a two car garage…please, don’t get me started. These are general concepts that worked for us and also work for my clients. There are so many other things to consider. It does require being engaged in the process and often going outside the traditional boundaries. You’ll need a cooperative contractor and I always recommend an architect. Many books and articles have been published on this subject. Send me your ideas. When I get enough, I’ll write a follow-up post. Recommended reading: “Blueprint Affordable“, Michelle Kodis; “Good House, Cheap House“, Kira Obolensky. Why a 10.000-20.000 $ car needs a house of its own which costs almost as much as the car? Wouldn’t be nicer to buy a newer car often? Ok, you said the same, but why should a car be parked in the basement? The basement is not a gift from the constructor, it costs big bucks. Why should you build a basement? For a washing machine? Do you need to store coal in the basement? Do you store pickles or smoked sausages? People used to keep their cars when they realised that they don’t need the stables. They drive a car, not ride a horse anymore. So why not to use the old useless space to keep the car over there. Cars are made to be use outside! They don’t need rest at the end of the day, they don’t get cold if it rains…. The manufacturers are very keen to make them waterproof. If your car is a 1930 Jaguar maybe it needs a garage. But this is not a car anymore, it is an investment. So, my advice: don’t park the car inside the house and don’t build a basement if some fancy soil doesn’t need a much deeper foundations. The answer is simple. Here in my part of the USA, all of the terrain is sloping. We must build our foundations down to extend the footings 3′-0″ below the finish grade for frost protection. When your lot slopes as much as it does, you have to build as deep as a basement anyway to get the foundation below the frost line. Some people build crawl spaces, but they are a maintenance problem. So the basement is a way to use the slope to your advantage. Also, it permits us to put mechanical equipment down there and yes, storage. My feeling is the basement will get built anyway, why use it all for storage of some future in-home theater. Having an integral garage is certainly a luxury. Chipping ice and snow off in the winter is really frustrating and hard on the car. If the lots were flat or if the water table was high where a basement is difficult, then I agree with you, don’t build the basement. Also, in an urban setting where buildings touch, a basement could be optional. I think each site is specific and the constraints have to be evaluated individually. Like I said before, basements are very common in my part of the USA in the southern and southwest regions, they may not be as common. Octavian, I’ve really appreciated sharing comments with you. You should join our discussion on LinkedIn’s Residential Architect’s group where I discuss the garage again from my recent blog post. I’d love for you to join the discussion and mix it up with those who don’t necessary agree with my premise that the garage (especially a 3 car garage) has overtaken the American development house. I advocate for designing houses better to hide them but also question why someone would need a 3-car garage at all. Join the group and share your perspective at http://linkd.in/vsZrHp. You may find some who will sharply disagree with you (as they have with me), but I’ve come to respect you and your comments. It may make for good conversation. Keep an open mind about other peoples needs for a garage or basement, they are not always the same as yours and also the regional weather and soil conditions where they live can determine if it is a good or bad investment. Garage: I live in Kansas. Thunderstorms are common in the evenings and nights. If you don’t mind your car being beat to hell by hail once or twice a year, don’t build a garage. Also, I am a DIY person and my garage is quite often my shop and when projects are going on the cars get displaced. Basement: Here we do not have the expense of digging in rocky soil, so basements are afforable and a fraction of the cost of the finished space on your main floor. You need some kind of foundation anyway, so why not spend a little more on a basement, then you can house all the mechanical stuff there instead of trying to figure out where to squeeze it into your main floor plan. It also makes it easy to maintain that equipment and provides storage or additional space if your needs change. We are great about not acquiring a bunch of “stuff”, but everyone still needs at least a little bit of storage. One more thing concerning the basement; we live in tornado alley and a basement or at the very least a storm shelter buried in the backyard is a must for keeping my family safe. Additionally, in our area most people will not consider buying a house without a basement, so it does help with resale value, even if it is unfinished. Kevin, you make some good points that argue to designing regionally rather than simply copying something seen in another part of the country. I totally agree that one has to take into consideration the regional climatic concerns as well as the client’s desires. I imagine in Kansas with it being generally flat it is more of a challenge to get the slopes to work. Here in PA and on my lot, there is plenty of slope. As for using the garage for DIY, well, that’s personal. I do much in mine, but i just back the cars out. Most people have basements in PA, but i know in other parts of the country, basements are unusual. Yes these are just suggestions, some will work, some won’t. I have found that many of my clients wouldn’t adhere to any of these and would skimp on important things in exchange for granite counter tops and three-car garages. Thanks for reading and sharing. yes. no basement – just an insulated slab and build passive. need a garage ? build it on the back (north side, where you’ll want less windows anyway). use the south as your furnace – solar heating the slab inside. build close to square – two story super insulated with low thermal bridging. incorporate a single pitch steel roof (or 2 single pitch steel roofs if you incorporate clerestory windows on the second floor. 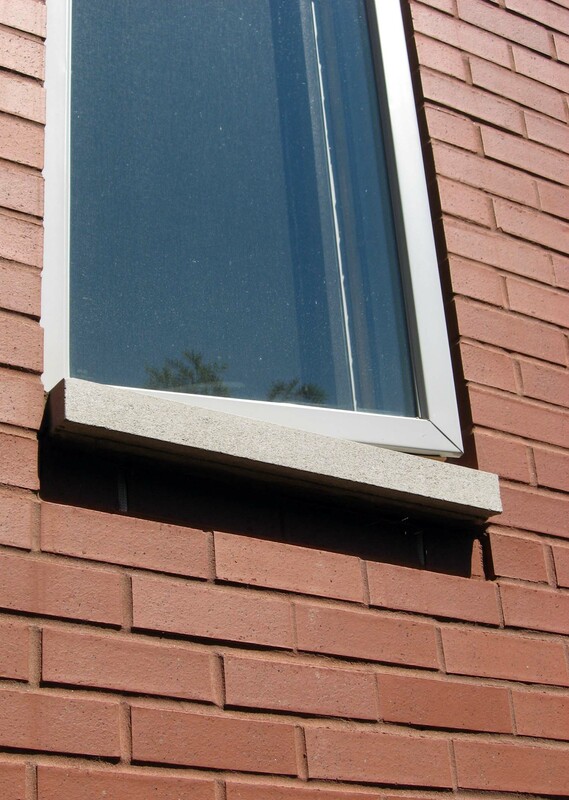 use triple pane fixed frame windows where possible. incorporate a heat recovery ventilation system. spend your former utility bills on good beer. Josh, I appreciate your passion for Passive House and for joining the conversation. I really like the ideal behind it and plan to keep learning about it. The truth is, it will be a long time before the average Joe buys into it. Basements in my region are far too important as well as dealing with topography. Nothing is flat here. Building a detached garage costs more than just placing it underneath in the basement. Building a slab on grade house on a sloping lot doesn’t make sense around here. I was able to orient my house to the south as you suggest, but that is really a site dependent issue. Lastly, getting all contractors educated on the many details and tests will take time. Again, I love the idea and would consider it if I built again. However, I’m an architect who gets it. Despite the low utility bills or expectation at least, many people will not pay more for the passive house so that they can pay almost nothing on utility bills later. Architecture is messy. I agree – it’s site dependent (well, the slab part is anyway). My thoughts are that passive building can be done very affordably – and that maybe a little ‘aggressive’ needs to be incorporated into the ‘passive’ – in terms of site selection, etc. The slab is one ‘check-box’ in striving toward that affordability – and, for me anyway, it suits the needs of the structure better – as a heat store. My other ‘cheats toward affordability’ are the single pitch roof, square build, 2 story for smaller footprint, etc. I think some folks might place a stigma on slab builds. For me it’s just a question of utility and design fit. Love the mountains too. When I build the place I’ll be able to get up to my old hills more often – and still leave room for priorities – like good beer. That’s the plan. Design a $100k passive home in a selected area (a given township maybe). $100k would include land purchase and all site prep. These studies are fun, but the people that come to an architect to design a house obviously care enough to hire an architect. However, most and I mean most, are not interested in that type of unconventional. Spec houses will dominate forever and I do not play into that market. To design a house for $100K including land and site prep is almost impossible. Even the guys in Philly who tried it didn’t quite make it to be honest. The land alone would take a third or half of that. Most new houses around here (one-offs) go for $160 to $200 per square foot and up. Most “cool” architect houses are way about that range. So for those who would consider building a house (apart from the maverick person who just wants to make a statement), would not want a house that small. It’s an inherently flawed argument except for the 1 in 10,000 or more that would consider it. The real question is how can we build better houses for everyone? Regulation – no way, that just alienates and infuriates Americans. It’s like the story of the wind and the sun arguing who could take off the man’s coat. The sun clearly won. I wouldn’t give up my garage (which is in my basement), but we need to make a distinction between elements that make our lives nicer, if not tolerable and items that are affordable. Perhaps one might forgo another feature in order to gain a garage, but it’s certainly not as important as the bathroom. When we’re talking affordability, we all have different priorities of what we’d be willing to give up to make budget. If the budget is that tight, something might have to go if it means not building the project. I’m sure I would give up something else if I lived in Canada too. I’m in favor of garages – I’m not in favor of them being the most prominent feature on the house. See my post on “Can I have a house with that Garage?” If I lived in Canada with -50C, I’d give up the granite counters and walk-in-closets before I gave up the garage. Of course, I imagine there might be days you can’t get out of the garage if there’s several feet of snow! When you live in a place that snows 6 months out of the year, a garage is a luxury that I am willing to pay for. Trying to scrape off snow and ice at 6:30 in the morning while keeping kids warm in their car seats is not for the faint of heart. It can also be dangerous. I have fallen more than once trying to clean a car of snow and ice in the early morning and in the dark. And while manufacturers do design cars to be “waterproof” as you say, cars in my neck of the woods show a lot more wear than say, Arizona, after driving on snowy, salt covered roads. Leaving your car out in the elements 100% of the time when you live in a place with extreme temperatures does shorten its life. And while I am all for ditching “stuff” there are just some things that people don’t want to get rid of. Our family enjoys biking and our garage houses our bikes, which while also “waterproof” will get damaged if left out all winter. We also need a place for the snowblower. Sure, we could stop being so lazy and just use shovels, but when you have a driveway that is super steep using shovels becomes literally hazardous. My point is, people have different priorities, and while a garage may not always be a necessity, for some it is definitely worth the price. One of my favorite things about moving out of a basement apartment into my own home was having a garage. There are many arguments to justify a basement, I agree. But nevertheless, the basement is a thinking stereotype and is not THAT necessary in the 3rd Millennium. Wow, awesome post Lee. And what do you know…seems good design/architecture has a lot in common with building affordably…a least judging by the 10 points above. I like the quip about a ‘myraid of things glued on’. I’m definitely going to send people from my blog to this post! Thanks…what’s up with the new picture? great tips. I had considered to build a house because I think it’s more expensive to buy a house than to build it. Building your own home has more flexibility than buying one ready made. We have freedom to decide every detail, from location to size, from overarching style to finishing touches. So it’s unique and different from anyone else. Thanks David for the mention. Good points, really. The thing about the garage is about choice, preference & lifestyle. I love the idea of putting it under the house. In addition to a savings on your taxes (smaller footprint) a garage for people like me is a necessity. In addition to having a place to tinker with things, our cars are our second highest investment. I happen to like cars and I like to hereto them nice, so a house for them is imperative, whether the jaguar is an antique or a 2003. Thanks for reading and for joining the conversation. I am not a fan of garages architecturally but I love having my cars inside. This is an American luxury. I mentioned in the post that it is not always possible to use the basement for a garage, especially if the region doesn’t support a basement garage (e.g. Florida) or if the land is flat (Kansas). To me a car is a necessary evil and not an investment, but if I had a client that wanted to celebrate their car(s), then I would develop a design where the garage wasn’t such a necessary appendage. It can be an opportunity as much as a liability. Most people are not treating the garage properly though in most American houses. nice post really helpful to build a quality house within our budget. I enjoyed this and when we build I’m sure it will help. We live in the arctic, ok just winnipeg, mb. But its close enough to the arctic for me. The garage here is a must for me, especially when its -30 and you’re transferring small children in and out of vehicles. And we can’t put them in the basement I don’t think…never seen it done here! But I agree with everything else. Thanks again for the article! Thanks for sharing and keep warm. The basement garage seems to be a hangup for people still. If it’s not part of the culture of your community or region, then ignore what I suggested. I doubt in New Orleans or Miami, Florida they’ll have a basement garage either. However, in many regions such as mine where the topography will allow it, people are willing to pay $50K to $100K more not to put it in the basement. I find that troubling. We live in Georgia, and wish that we had a basement for several reasons. It’s cool in the summer, a cost effective space, a good storm shelter, helps deter wood destroying pests, and eliminates crawling around under your house for the installation and repair of many things. I agree that cars can be left outside, but extreme weather is hard on cars, and if you’ve ever had rodents chew up your electrical wires it can be very expensive. Tree limbs, hail, and theft are also good reasons for a garage. However, fire is a risk with your car in the basement, my husband is a safety nut, and has never liked this idea. I have designed three simple homes and remodeled a few, fortunately with success. One of the problems that I see a a lot are builder/owner designed homes that are atrocious, no symmetry, mismatched windows, rooms with no place for the furniture, structural flaws, wasted space, doors banging into each other, etc. Purchase a good house plan, and a professional to make any major changes, OR hire a professional if you want a custom designed home. It’s a complicated process, and will ensure that you have a good investment. I agree with the other ideas, we built a very plain farmhouse, loved it, and put our money inside where we could enjoy it. A lot of exterior frills and complicated roof lines are very costly, it’s refreshing to hear some common sense ideas. Thanks Laura for sharing and for the kind words. Design can be common sense and a few frills can be added if wanted. I like your personal insight with respect to maintenance items. I’m not one for symmetry, but your list is spot on. I believe in balance and good composition. Container homes are extremely affordable and relatively simple to build. This step by step guide is very easy to follow. Thank you, I’m glad it helped. Architects love container homes. I’m afraid they’d spook most of the contractors (and clients) in my region. I’m a fan though. Really great & informative post. i am highly appropriate to this helpful article about affordable building. last year i have build a building like this by roofing contractors middlesbrough. Great ideas. I’m looking online for a small open concept two bedroom plan for a cottage. No more than 800 sq ft.
Having a hard time finding something simple, yet stylish. These tips are worth listening to. Do you live inside or outside your house? When you live inside your house, the outside really shouldn’t matter as much as it does. Just have a few decorations, to let people know who lives there, and put the rest of your money into things you will actually use and such. Tom, I appreciate your contributions and I would tend to agree with your intent. However, I wouldn’t phrase it that way. People today do spend too much on the complexity of the exterior when it comes to builder homes or production/spec houses. There are multiple gables, and gingerbread that is on the outside – where we don’t live. My take that connects with yours is that we cannot experience this on the interior. These houses have complex truss roof systems to create those shapes that are invisible on the interior. I believe there should be a relationship between the interior and exterior such that they work together. I tend towards minimalism myself for several reasons, but I also wouldn’t advocate a plain, unappealing exterior with a lavish interior. There has to be a balance and that comes down to how people prioritize. I would take your thoughts as far to say that I don’t believe it is worth putting large dollars into the kitchen, counters and appliances for a house with a cheap envelope. 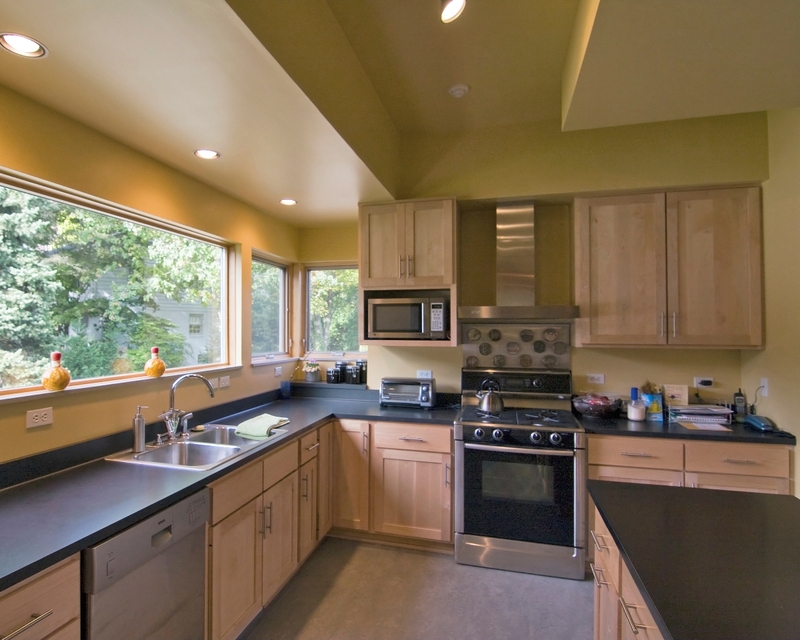 Fiberglass insulation, vinyl windows and vinyl siding don’t make sense wrapped around granite counters. This is very personal territory for most people, so everyone will have an opinion. Thanks for taking time to join the conversation. I really appreciate this conversation. When someone says buying is more expensive than building new… i need to implement it. I live in the small 1100 sq feet house and need to tear it down and rebuild.. All options so far does not seem to be affordable. 130$ per sq ft is out of my reach. I need to stay about 100$ sq ft range.. is that doable? This figure really depends on too many factors to say yes or no to your question. However, in most regions in the USA, $100/SF is virtually impossible these days. We are just in the beginning stages of planning our house that has to be one floor and Universal design (my husband is in a wheelchair). The thing is, we are building on flat land in Hawaii, and I am a staunch minimalist…all I want is a rectangle with plain white painted exposed gable trusses and shed style covered porches on the sides. I literally only want walls around the bed/baths and I don’t have to worry about insulation. I fail to see why this is so expensive…I mean how much more can I strip away? I am also trying to design this on a 4′ scale so I can minimize extra cuts on materials…any other suggestions? Great article! I work for an affordable house company called IESHAHOMES in Australia and New Zealand, and a lot of you points apply to our methods of building. 🙂 Our designs are affordable as well as architectural. They’re also based off one set of floorplans, that can be adapted to 4 different home styles. (4 in 1) Designed that you can build and grow. I think you can have a house built to any style or price you want. You might need to design it with a modular aspect in mind. This way you can add on a piece at a time as your budget allows it. Start small and grow as you need. I also would rather have a little more land to build on then a really expensive house. Great tips here. I always say “less is more” and you seem to share a similar philosophy when it comes to building. Lately, I’ve been trying to look into more sustainable building methods that will help homeowners save more in the long run but still not have to sacrifice such a large investment upfront. (There’s a general thought that building “green” automatically means spending more money, but that’s not always true.) Appreciate you putting together this list! Awesome post, thank you for sharing these great info and tips. I honestly a fan of small houses. The tiny but it has everything you might need to live there kind of house. So I am totally supporting this whole idea of making yourself an amazing affordable house! Oh and another important thing is that you need to be clever to use the space. Maybe you can go with folding bed, but of course, you have to sacrifice your privacy since your bed isn’t really in the bedroom but nonetheless, space efficient! But yea this kind of affordable house is definitely a greenhouse eh? If you are interested in such project, you guys should totally check http://www.biesterbos.nl portfolio. They have a lot of amazing works! You definitely should check them out, thank you! I agree and these tips are worth listening to. My thoughts are that passive building can be done very affordably. Thanks again for the article. I had considered to build a house because it’s more expensive to buy a house than to build it. I just finished my house 2 months ago with all design that I wanted and guess…I didn’t expense too much cost. Besides, my house it’s unique and different from anyone else. Thanks to Biesterbos who help embodied my dream house. They are known as best developer and affordable one. You shall contact them at http://www.biesterbos.nl to know more about their incredible projects. Great tips. As someone who is extremely interested in building an affordable home I found this extremely useful. http://www.biesterbos.nl is the best solution. They do an amazing job and are developers with cost-effective projects. You should check them out, maybe they can help you with your problem. I don’t recall making any reference to $100/SF in the article, but you’re right that’s not possible; in fact $200/SF is barely possible in 2018. If you’ve read enough of my blog, why would you start by researching contractors? I liked your tip to build the garage into your basement if you live on a sloped lot. My wife and I are looking at building our own home, and that’s something I definitely think would be cool. Your furniture buying tip was good too, there’s no need to buy extremely overpriced furniture. I liked that you talked about how you need to choose your materials really wisely. It might be smart to know where to spend money and where to save it. 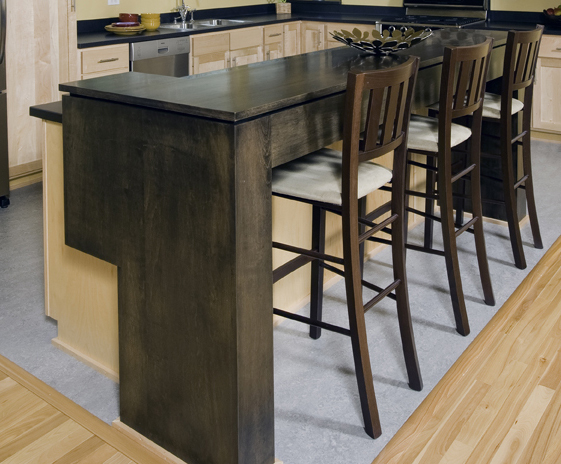 It seems like you should spend money on kitchen countertops and try to save some money on kitchen tiles. It might be smart to talk to a contractor about places where you can save some money by going with a different material. Areas to save or splurge are personal and should be a reflection of one’s values of how they choose to live. Countertops would not be high on my list, but again houses should be personal so people can love their houses and never want to move. Thanks for these tips for building a new house. I’m glad you mentioned that it’s acceptable to splurge, but only where it really matters. It sounds like you should have an additional budget set aside so you can make any changes to the original plan you made. You mentioned that we should choose the material we build with wisely. Do you have any more statistics on that? Like hoe much pressure steel can take under a variety of circumstances? I would love to know more about building materials! I don’t know how to respond with statistics on building materials in light of your question, nor does this post begin to address anything technical as you question. The choice comes down to being deliberate after considering options as opposed to making decisions based on peer pressure. A good choice is one that has durability, the love of the owners and contributes to the overall design and value of the house. Poor choices are based on trends, shallow indulgences that will be replaced within a short time frame and ones that will not last, thus requiring replacement and use of more resources. My wife and I want to finish our basement this year, so thanks for these tips. I like your point about choosing materials that are durable and have bold colors. We’ll be sure to do this so we can make the design “pop” like you said.